On Wednesday 27th June, the Year Three teachers were joined by St. Emilie’s staff, St. Emilie’s families, and the wider St. Emilie’s Parish community to offer thanksgiving at mass, for the school term. 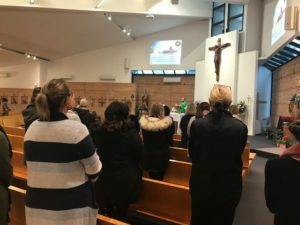 The significance of NAIDOC Week was also highlighted within the mass, and we were given an opportunity to share in a community prayer for our Aboriginal and Torres Strait Islander brothers and sisters. 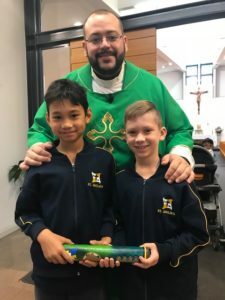 Harry had the important role of carrying the St. Emilie’s ‘message stick’ up to the alter, at the beginning of the mass. It was wonderful to share in the celebration of NAIDOC Week, together as a school and parish community.